Now on display in the Scholars' Commons (First floor of the East tower, Wells Library) is an exhibit curated by the University Archives. Voices of '68 is a picture of student activists at Indiana University in the late 1960's. Stop by for a walk through history, presented through original documents, video, and curated content. If you feel like learning more, there are books available for check out in the exhibit that go more in to depth on these topics. 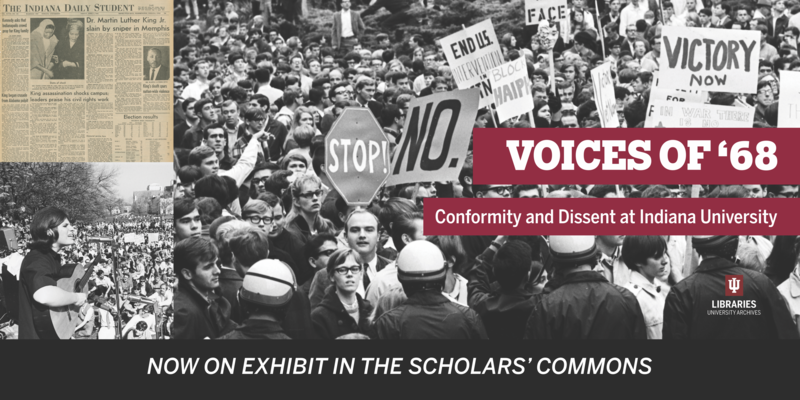 Political activists, civil rights advocates, and war protests are on display in this inspiring exhibit. On display July-September of the Fall 2018 semester.